Meet MB&F’s Balthazar, the latest release from the (relatively) young Swiss company MB&F that continues to push the boundaries of horological concept art. It’s hard to pigeon-hole MB&F’s Balthazar into a functional category, but if we must it would be ‘Table Clocks’. Categorising Balthazar as a table clock is akin to categorising the Batmobile as a car, so now that we know what this machine functionally represents, lets recategorise it as hyper-creative horological concept art. I feel much better now. MB&F are used to being different and that’s what makes this company so exciting to follow. Maximilian Büsser and Friends (MB&F) opened their doors in 2005 in Geneva, Switzerland and have continued to release what they call ‘Machines’ that resemble everything from watches to table clocks to music machines; all cutting edge, remarkable and modern with a distinct homage to mechnical watchmaking. Balthazar is limited to 50 pieces per colour, available with either black, silver, blue or green armour plates. By watching the below video you’ll see that ‘he’ is wound by a key disguised as part of the shield. The movement, similar to the previous MB&F table clock ‘Melchior’, is an in-house creation by L’Epée 1839 and comprises of 405 components, 62 jewels and 5 barrels in series. The movements escapement is the pieces brain and is therefore cleverly seen through the polished glass on Balthazar’s head. The completed piece weighs in at a sturdy 8.2 kg and is predominately comprised on nickle-plated bronze and stainless steel. Balthazar stands tall at 39.4cm high x 23.8cm wide. So how do you read the time? Firstly, understand that Balthazar has a ‘Dark Side’ which represents a skull face and a ‘Light Side’ which appears to be smiling. The twin-discs on the chest feature MB&F’s signature numerals and respectively display jumping hours and sweeping minutes. The red pupils in each eye scan over 20-scond intervals as retrograde seconds display. The ‘dark side’ chest displays the phases of the moon on the double hemisphere moon phase indicator. You’ll also find the 35-day power reserve indicator on the belly of the machine. 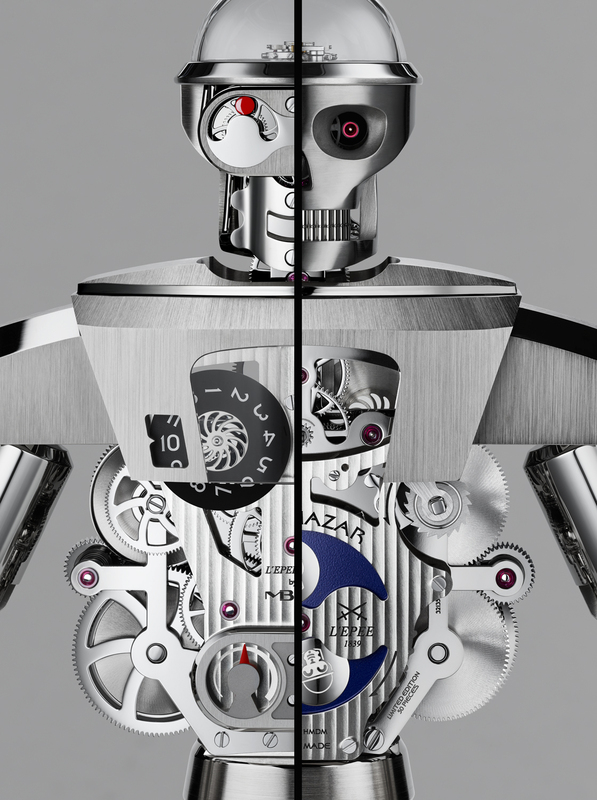 Twentytwoten.com cannot wait to see the next machine from MB&F.